As a young teenager in 1963 I spent a week in Downeast Maine attending church summer camp in Washington County. The photograph shown here is me on a speckled Appaloosa years later, but the surroundings illustrate some key points in this story of the Downeast horse training lesson. On the last day of youth camp I was asked to volunteer another week as a counselor for the next group of campers. They were a mixed group of boys and girls like ours except they were much younger. The food was great with plenty of it, so I justified tolerating the inevitable last night of camp singing Kumbaya around the campfire. 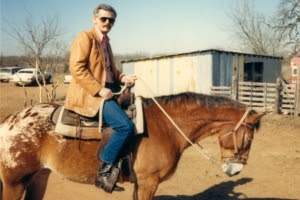 Mornings were spent caring for the trail horses, afternoons as lifeguard at the lake, and nights I was the live-in cabin police for one group of boys. While the kids were in classes, feeding and grooming the horses took very little time, so most mornings we were free to go horseback riding. Did I mention great food and plenty of it? This was my kind of job. After waiting years for that pony under the Christmas tree, this was dang near as good and maybe better. Mind you I had zero experience at any of my assigned duties. I did save 2 youngsters from certain drowning that week, and for some reason as I say this I’m wondering if either turned into axe murderers… or politicians. One crybaby from my cabin wanted to go home the first day, so I excused myself for a peek in the counselor training manual, and then distracted the boy with fun things to do. That one worked instantly. Otherwise I managed to keep my group entertained with trumpet solos and Bert and I stories memorized word for word. Ayuh. I knew ’em all. It turns out horses require strong guidance just so it’s clear who’s boss. On the first morning of camp with chores done and kids in class, a few of us teens saddled up and went for a ride. Everything I learned from the western movies at the old theater in Milo sure came in handy. I’d pull reins left or right and that horse reacted perfectly. We took the short trail and trotted along at a leisurely pace, and arrived at the end about a half mile from the campgrounds, and then it happened. My horse was big, or at least for my size it looked big. I learned later that they sense your confidence and unless you waver, you are in control. Well, Chum, this brute spun at the end of that trail and took off at full speed making a beeline for home. As I shouted, mind you, that rascal kept going faster and ignored every command I had memorized from the Roy Rogers and Gene Autry movies! Now imagine a stable similar to the one pictured here. As the building came into sight, that horse wasn’t letting up and went right for it, straight through the door so I had to duck, and still going at top speed. With one final leap he planted both front hooves about 4 feet from the back wall coming to a dead stop just as he lifted his rear end. I hit that wall seeing stars, and I swear I was suspended for a moment just like a cartoon, then plopped to the floor. Lesson over. He could have stomped me to death. I believe he was smiling.